I have been looking for a quick snack to grab post workout and I think I’ve found the perfect treat. 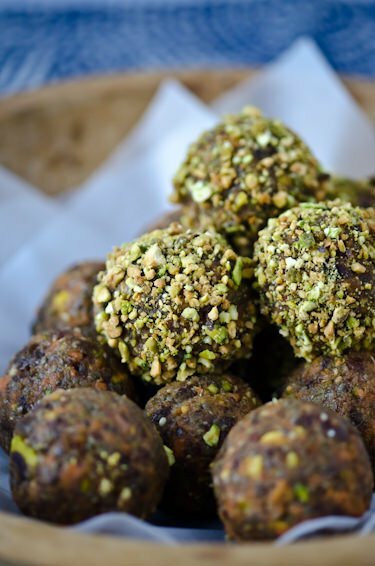 These carrot cake bites have a texture similar to a Lara bar and come together from start to finish in 10 minutes or less. I just grab one or two when I need a little pick me up. 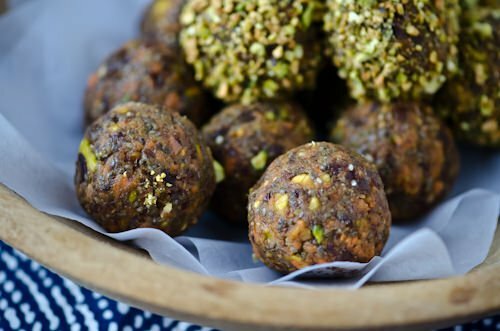 Thanks to the addition of flax meal, chia seeds and pistachios they are full of healthy fats that keep you satisfied. I added some cinnamon and nutmeg to really bring out the carrot cake flavor and I rolled some of them in crushed pistachios for a nice extra bite. Dates are critical in the mixture since they really help bind the mixture together but you can experiment with a variety of flavors and textures. Walnuts, cashews or pumpkin seeds would be great alternatives and you could replace the carrot and pineapple with cranberries, cherries, blueberries or any other fruit you’d like. In a food processor, process the dates, pineapple and carrot on high for 30-60 seconds until finely chopped. 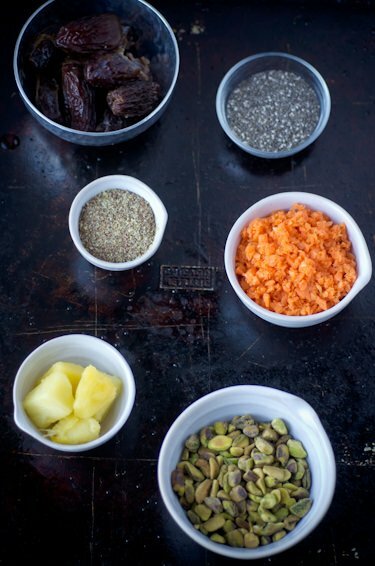 Add the pistachios, chia seeds, flax seed, ginger, cinnamon, nutmeg and salt and process for another 30 seconds. 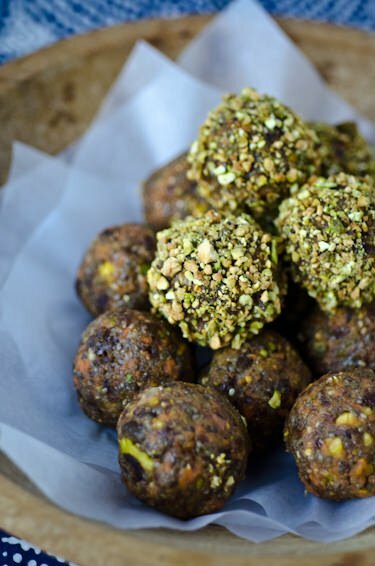 Scooping a tablespoon at a time form into balls and roll in extra pistachios if desired. Store in the refrigerator for up to 5 days or store in the freezer for up to 3 months. I found your blog through Pinterest and have been wanting to make these for a week! I have all the ingredients but I forgot to buy pistachios. Have you ever made these with hazelnuts, pecans or walnuts? They would be wonderful with walnuts and probably more traditional for carrot cake. I think that any nut you like would work, but I don’t think I would use peanuts. Let me know if you try something different and if you like it!